Let’s take a moment to talk about one of the most spectacular structures built in the UK, one of the most popular tourist attractions in the world, and little known to most people, a venue where you yourself can actually have your wedding! As some of you will recognise, we actually covered this particular ‘venue’ in a previous blog post talking about unique places to get married in London, but we thought we would cover it in a bit more detail over here. We are in fact talking about the London Eye, The Millennium Wheel, or how it’s currently known as the Coca-Cola London Eye. Now, most people just think of this place as a tourist attraction, a lovely place to visit with your family to enjoy a view of London whilst accompanied by 30 other tourists. 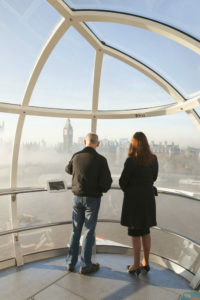 But make no mistake about it, this iconic wheel is actually a very popular place to engaged and married too! In 2013 this magnificent wheel received its 5000th engagement, and with over 500 people getting married in the London Eye since it opened to the public in 2001, it has proved to be a unique and timeless place to celebrate the most special moments in your life. So we wanted to compile a list of some things you probably didn’t know about the London Eye, interesting facts and figures, and some additional information for anyone that is considering getting married there! How much does it cost to get married at the London Eye? You’ll find prices starting at £2890 for the Classic Package, increasing to £3710 for the Celebration Package. How many people can come to the ceremony? You’ll find it capable of holding up to 16 people, which is perfect for having a small tight-knit ceremony with only your closest family and friends. Of course this is something to bear in mind as you may find yourself a little bit limited by only being able to bring such few people to your ceremony, but it is also gives you the ability to limit your ceremony only to those who mean the absolute most to you, celebrating in a private capsule, with flowers, champagne, and everything you need to make this day as special as it deserves to be! Should we get married in the Milleium wheel? Well, that is not for us to decide. This is what we can tell you though, as you most likely already know your wedding day is likely to be the most unique and unforgettable day of your life, and as a result it should be treated as such! So why not couple that with getting married at one of the most unique places in London, allowing for some to the most spectacular views and incredible memories. As a wedding videographer in London, I can only imagine the beautiful shots we’d be able to capture for your wedding day, and how startling and dazzling the final wedding video will look, with the incredible natural lighting shining in from all angles of the capsule and the stunning views of London’s breath-taking skyline. 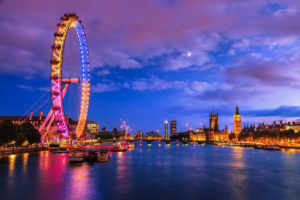 In total you will be 135 meters above the ground, overlooking the River Thames, Buckingham Palace, Big Ben, and many other unique British monuments. The London Eye was actually the highest viewing point in the whole of London until The Shard was built and over took it in height. None the less, it’s hard to deny that the view from the top of this wheel is something worth experiencing on your wedding day. And if you are considering choosing a far more ancient wedding day location such as the Tower of London, then check out our post on the subject.